Mark Argo is pleased to present his first exhibition in his home city of Toronto, "Communication Mods" - a DigiFest 2006 New Voices Winner. The exhibtion features five works that explore human-to-human communication through the process of modification. Using technologies such as WiFi, Bluetooth and SMS each piece asks the audience to participate by submitting some of their personal media - music, photos and videos - using laptops and cameraphones. The end result is a snapshot of a particular community at a specific time and place though the catalog of collected media. For the past five years Mark Argo has been experimenting with digital technologies, focusing on creative applications for interpersonal communications. Currently, his interest is in adaptation as an evolutional process which takes place between humans and their created technologies. As humans alter the way they communicate due to the adoption of new technologies, Mark modifies and redesigns the usage of computers, mobile phones, cameras and MP3 players to create other communication methods among humans. In other words, altering the way technology works to explore new forms of interpersonal connections. This show marks the debut of 'WhereTheHeartIs', a cameraphone-based installation created specifically for Toronto. The audience is asked to use their cameraphones to contribute iconic images of Toronto - people, places and things - to a screen in the gallery. The images are then sent to small screen which the artist wears over his heart. During the two-month exhibition, this installation will create a direct link between the artist and his home city, regardless of location. The 'HeartScreen' will be showcased in New York and Italy as parts of other exhibitions. Mark Argo's work has been internationally exhibited in New York, California, France (MAMAC, 2004), Austria (Ars Electronica, 2005), Japan (NIME, 2004) and Korea (FF, 2005) and has been featured in the New York Times, Wired Magazine and Linux Journal. He is currently in residence at Fabrica Communication Research Centre in Treviso, Italy. 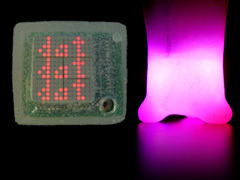 "Communication Mods" is being launched as part of DigiFest 2006, an International festival of design and media culture presented by the Design Exchange in partnership with Harbourfront Centre and Ontario Science Centre. 'WhereTheHeartIs', is a cameraphone-based installation created specifically for Toronto. The audience is asked to use their cameraphones to contribute iconic images of Toronto - people, places and things - to a screen in the gallery. The images are then sent to small screen which the artist wears over his heart. During the two-month exhibition, this installation will create a direct link between the artist and his home city, regardless of location. 'hugMS' and '.dot.dot.dot' are two bluetooth objects designed to augment mobile phone communication. 'hugMS' attempts to create a system for transmitting an emotional gestures, namely hugs, using SMS messages. '.dot.dot.dot' deals with the exclusion of the private mobile phone experience. 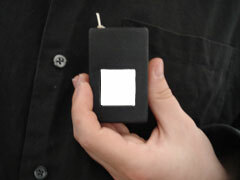 It is a wearable display that shows to the people around you who you are talking to, or what you are messaging. CoDeck is a hardware/software platform for community media sharing embodied in a late 1970s Betamax machine. The community can upload media using a laptop or local desktop computer, or record an 'on-the-spot' message by pushing record on the video deck and speaking into the attached video camera. The CoDeck is connected to a TV and plays a constant stream of community-shared video content. Written comments can be added to each video, displaying at the bottom of the screen while it plays. The Bass-Station is a mobile and networked community-media space housed inside a vintage ghettoblaster. Much like how the portable boom-box became the hub for urban artistic communities, the Bass-Station reflects this history for digital artistic communities. 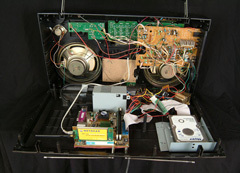 Contained in the ghettoblaster is a full modern computer that creates a localized wireless network, and features bulletin boards, chat rooms and lots of music. 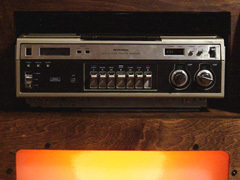 Music can be uploaded, downloaded and played by using a laptop or the knobs on the front of the boom-box.